Explore ways to use STEM lessons and approaches to help students practice cross-disciplinary thinking and build skills in science, technology, engineering, and math. Edutopia's flagship series highlights practices and case studies from K-12 schools and districts that are improving the way students learn. Below, find downloads used by practitioners at a featured school, and dive into real-world examples of STEM learning. 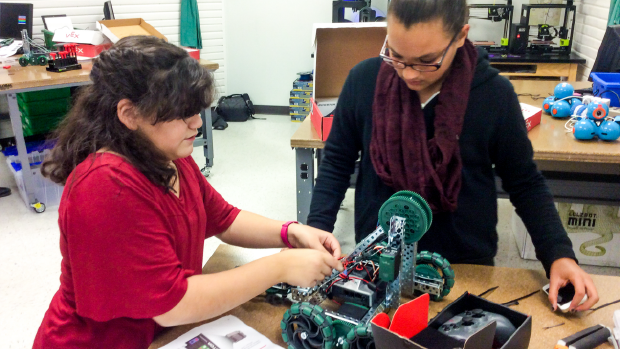 At Mc2STEM High School, integrated project-based learning and real-world internship experiences build the crucial link between academic achievement and future economic success. See how this school designs rigorous projects that blend STEM with other core subjects, find information about research-based practices for STEM learning, check out an infographic on why STEM education matters, and explore a few of the school downloads below. Bridges Project Design Document: Download a PDF document that describes how students learn about the math and engineering concepts necessary to construct bridges and explore the symbolic meaning of bridges in literature, history, and social studies. Communications Project Design Document: Download a PDF document that describes how students address learning goals across multiple subjects through design and construction of a sound system and the writing of original music. Rockets and Robots Project Design Document: Download a PDF document that describes how students build robots and construct rockets to complete a variety of space-inspired missions and reach reach learning goals in various content areas. Blank Project Design Document: Download a blank PDF template used to design and plan capstone projects at Mc2STEM. Sample Fab Lab Projects: Download a PDF document with photos of several projects that were done in the Mc2STEM Fab Lab.